A 52-piece orchestra of S.F. 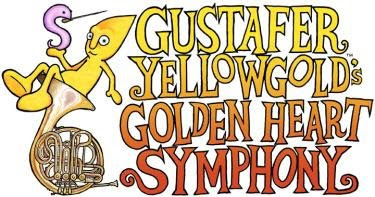 public school students joins forces with Morgan Taylor, the creator of the well-loved animated sun drop Gustafer Yellowgold. Together the students and Taylor bring the adorable character to life through catchy story songs. Proceeds from the concerts benefit the Summer Music Workshop, a free summer music enrichment program for fourth through 11th grade band, orchestra, and chorus students enrolled in SFUSD public schools. Presidio has a beautiful auditorium, and it should be a great show. They brought a costumed Gustufer onstage yesterday at the all-city elementary band and chorus festival yesterday over at Lincoln High, to promote the show. I hope it went well today and raised lots of dollars for the summer program. The band/chorus concert was great, too--always amazes me how the beginner trumpets, clarinets, flutes, violins can sound so great together after just a few months of lessons.